As LL cool J once said.... “Don't call it a comeback, I’ve been here for years”. Thank goodness carpet has made its comeback! I like rooms to feel a little ‘edgy’, I like intense colours, contrasting textures (lacquer, parchment, raffia) and my preferred scale is oversized. A wooden floor everywhere just feels a bit soulless and empty. 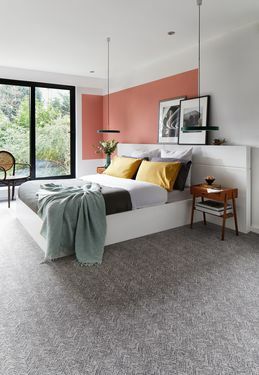 For me the wall colour, the carpet and the lighting are the three most important elements to an overall scheme - they are the foundations of a room. Nowadays carpets have big characters, I am using everything from bold patterns, like the ones in the Timorous Beasties collection to sustainable materials. I like designing bespoke carpets that are almost 3d, shaggy bits layered on top of smooth, ragged wool fringing around some bits and playing with contrasting textures, adding interest as well as some playfulness. Although opulence is out of fashion , ‘the new luxury’ is all about craft techniques and tactile immediacy, using contrasting materials. Cleverly combined materials, creatively implemented ideas and simple opulence form a new kind of glamour. Colour blocking and geometric patterns have also been huge recently. I love these in the new Brintons Perpetual Textures collection. While a piece of art or furniture normally serves as the focal point of a room, I have found that what sits underneath them makes just as much of a statement. Carpet is my canvas, it serves as a backdrop , the wrong carpet can make or break the whole look. Right now I am using a-lot of deep pile silky shag carpets (yes, Shag is back) in all one colour (usually in jewel tones like deep plums, dark lilacs and navys) to add texture- they feel very decadent. When a room feels luxurious, it creates a warm and inviting atmosphere. For an upcoming Londonewcastle lobby area we are using a deep pile blue velvety carpet beneath 3 huge Venini chandelier’s by Carlo Scarpa. I always use a statement making carpet on entrance hall staircases. I love a bold staircase! By adding a geometric or patterned design, you instantly make the staircase a focal point. If I can’t find exactly what I’m looking for then I’m well known for torturing my poor carpet fitters by cutting up rugs or different offcuts of patterned carpet and placing a different piece and design on each individual stair…it's time consuming but the effect is stunning. I also like to give a nod to the spirit of the Mods by using graphic black and white striped carpets.